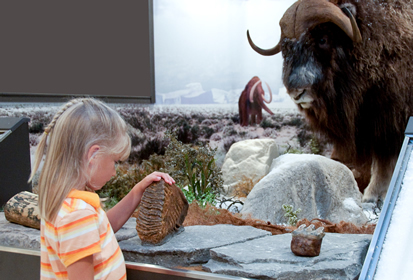 Ice Age Imperials is a traveling exhibit that tells the story of the Ice Age. 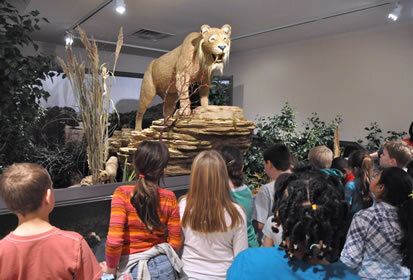 Its exciting interactive displays make the drama of the majestic animals that dominated the age accessible to all. Using two full-scale dioramas, a series of interactive displays and wall-mounted educational components, Ice Age Imperials prompt visitors to wonder: When and where was it? What was life like here during the Ice Age? How do today's animals compare to their extinct Ice Age relatives? 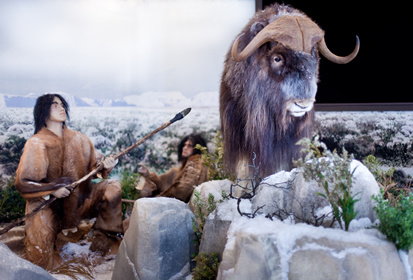 The Ice Age Imperials exhibit provides a rare opportunity for visitors to 'Touch the Ice Age'. 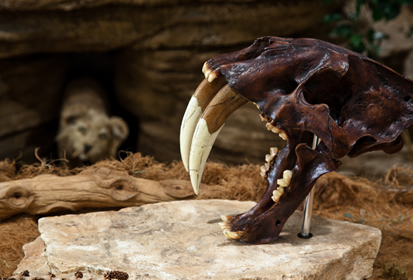 Interacting with real fossils from ancient animals like the sabertooth cat, woolly mammoth, giant sloth, dire wolf, giant beaver, and teeth from a huge Ice Age bear will make the Ice Age come alive to visitors like never before. Lessons of the Ice Age abound. How did glaciers form and 'move'? During the Ice Age, was there ice where you live now? Discover the answers within graphic displays about glacial size and ice depth. Try assembling the 3-D Mastodon puzzle, or immerse yourself in the History of Earth timeline where you can touch a wide variety of fossils from more than 500 million years ago to less than 1 million years ago. Designed for regional museums, each exhibit element is modular and will fit through a service door. The exhibit is flexible: we recommend a display space of 2,000 to 3,000 square feet for the full exhibit, but some elements may be omitted to accommodate smaller display spaces. The exhibit includes a detailed 40-page educator's guide. Check it out! Ice Age Imperials at The Neville Public Museum was recently featured on Green Bay's channel 5! Come in and experience the Ice Age. Interact with authentic 500 million year old fossils! A detailed guide is available for educators to use before, during or after a visit to Ice Age Imperials. The guide is appropriate for all grade levels and is designed so that you can extract what is relevant to your particular grade - the pages may be copied for use in the classroom. Ice Age Imperials may be leased for as little as 90 days or for extended time periods. 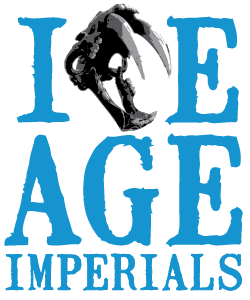 If you are interested in hosting the Ice Age Imperials exhibit, we invite you to contact us at antiquitiescompany@gmail.com or call us at (616) 863-0880 to inquire about available dates.